A new report forecasts Australia’s medicinal cannabis and industrial hemp mark could be worth billions of dollars by 2028. 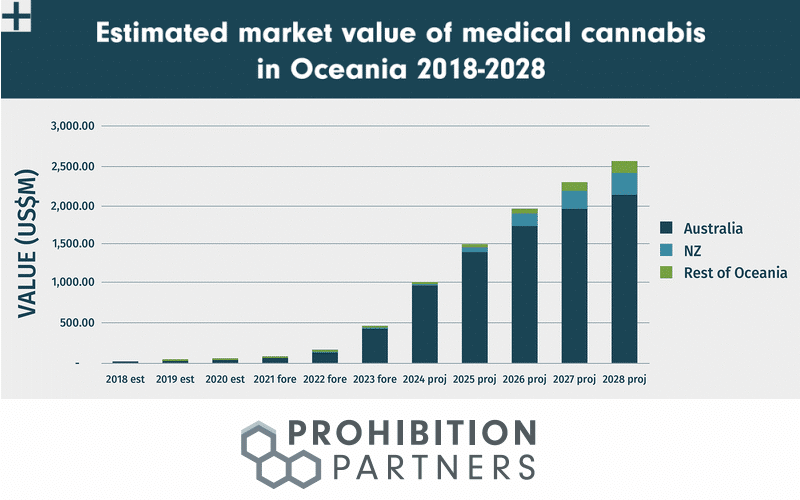 The Oceania Cannabis Report by Prohibition Partners says the region is poised for big things on the global cannabis scene, with it estimated to be worth US$8.7 billion by 2028. For Australia specifically, it could be benefiting from a US$2.5 billion medical cannabis market by that time, while the industrial hemp sector may be valued at US$18.6 million. Australia may have been the second largest destination for medical cannabis products from Canada last year, but Australia could become very attractive to investors as it offers an optimum climate for growing some strains of cannabis that are expensive to produce in nations such as Canada. One of the very interesting figures revealed in the report was while medical cannabis was legalised in Australia in 2016, just 1,059 patients have so far been prescribed it according to figures from the Ministry of Health. It’s not that there isn’t demand – plenty of Australian patients are eager to make use of it – but the country’s regulations continue to make it difficult to access and many doctors remain wary. While some simplification of rules governing access has occurred, it’s still a far cry from that of other countries. “Should Australia manage to improve patient access across all its states, the country could see a significant rise in the number of medical cannabis patients. As many as 400,000 medical cannabis patients are expected by 2028,” states Prohibition Partners. That would represent 377 times the figure now, and in just ten years. While the situation at home for local use of medical cannabis is still very challenging, another opportunity for Australian companies are exports, which were approved in January this year. Oceania is comprised of more than 30 countries and territories, including Australia. The region has a population of almost 41 million (Australia accounting for around 61%) with a total GDP of US$5.3 trillion. Total healthcare spend in the Oceania region stands at US$104.5 billion. The full Oceania Cannabis Report can be downloaded here.